Whipworms are small thread-like parasites that embed deep within the lining of the colon (large intestine) and cecum. Trichuris vulpis, the canine whipworm, is a common parasite and is a major cause of diarrhea in the dog. The feline whipworms, Trichuris campanula and Trichuris serrata, are uncommon and usually do not produce any clinical symptoms. 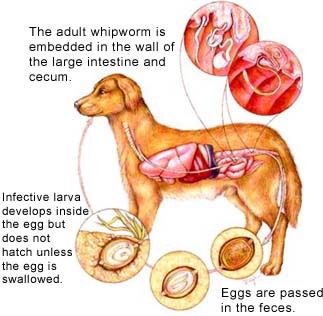 Whipworms infect dogs of all ages. Clinical symptoms often depend upon the number of parasites embedded in the colon and cecum. Symptoms can range from slight diarrhea to massive rectal bleeding. In most dogs, a mucoid-like diarrhea is generally observed. The diagnosis of whipworm infection is made by observing the characteristic parasite eggs under a microscopic. This test is routinely performed at most veterinary hospitals. A small stool sample is necessary in order to run the test. Medication is available for the treatment of whipworm infection. Very often, pets need multiple treatments in order to eliminate the parasite. Your veterinarian can discuss the method of treatment that is best suited for your pet. Whipworm is extremely difficult to eliminate from infected soil. Dogs that have access to these areas often reinfect continuously. A specific treatment protocol is usually required for these dogs.